Most people use side loading boxes to ship wide, flat items such as mirrors and picture frames. The side loading style of these boxes makes it easy to insert flat items and package them securely before shipping. 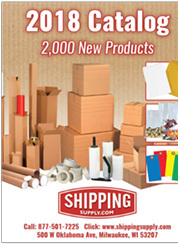 ShippingSupply.com carries two types of side loading boxes – the traditional kind that is secured with overlapping cardboard flaps and the kind that are self-sealing with their own adhesive. Self-sealing side loading boxes can be compared to UPS, Priority Mail, and FedEx Express shippers.